Feels great and is fun to do! Want to know how to use that dusty fitness ball you’ve got at home correctly? Add Stability Balls, Rollers, Bosu's and Core Boards to your workout and you’ll notice an increased spring in your step! This style of training will leave you feeling like you’ve had a challenging workout without feeling strained or compressed. After an hour with balance training equipment your core will feel toned and you’ll feel taller. Originally created by physiotherapists for rehabilitation of injured children, athletes, adults and seniors, functional equipment such as Stability Balls, Bosu's, Rollers and Core Boards, are now being used with just about every one because of remarkable improvements. These pieces of equipment are invaluable for those wanting to increase flexibility and prevent chronic back pain. They are great for enhancing sport specific training, they offer endless possibilities. Every exercise increases proprioception (the awareness of one's body), core strength and co-ordination. Unstable equipment can be rolled in as equipment for a complete program (usually a class format), or added to a personalized program targeted to specific needs. When used correctly, they are the perfect tools to create functional, effective and comfortable workouts. These days, most well educated personal trainers and therapists are moving away from traditional fitness equipment and incorporating functional, unstable props for the majority of their clients workout programs with much success. 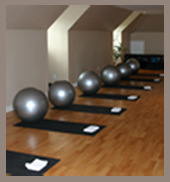 This program incorporates the versatility of the stability ball with the fundamentals of Pilates. We begin with a low impact warm up, followed by full body conditioning and end with gentle stretching. Each exercise on the ball involves using your core for balance, while your stomach and back muscles are strengthened through out the entire session . A great workshop to learn a few new moves on your ball or use as a home workout program. Some of yoga’s most beneficial poses require trust and lots of flexibility. Using the ball as support allows you to stretch, bend and rest on it. When your body feels supported by the ball, muscles then relax and the body can move deeper into the poses. Also, by incorporating the ball into more moves you can create an element of difficulty as balance and stability are challenged. Introducing the stability ball into your yoga routine allows you to explore poses you may have been afraid to try, as well as experience familiar poses in a fresh, new way. I have better posture and feel better about my internal and external health. I love the thrill and challenge of something new every time. I have lost baby weight and developed curves where there were none before, AND I have made some great friends. So very close to home. Peaceful and friendly surroundings. Beautiful views of the escarpment and the relaxing sounds of birds and nature.